At ShangriLlama, in Royse City, Sharon Brucato treats her woolly pack like members of her extended family. For a few bucks, you can take them to the park. In the beginning, Sharon Brucato and her husband, Paul, never imagined raising llamas would become a serious undertaking. “It started off as a joke,” Sharon says. Her son, now 22-year-old Tommy Brucato, fell in love with llamas during a family vacation in Germany. The family had gotten lost and ended up at a zoo that had a pen full of the creatures. “I just kind of became fascinated with them,” Tommy says. Eventually, the entire family started making trips to the rescue center, taking the llamas on walks around a park. Parkgoers would ask if they could walk the llamas, too, even offering to pay to walk them. “We were like, ‘OK, we’re already doing this. Why don’t we make some money and get some help?’ ” Sharon recalls. Due to arthritis, Drama Llama avoids walks. 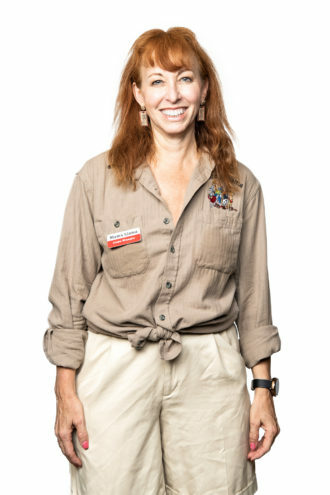 In addition to leading Llama Llessons, Sharon Brucato once ghost-wrote for health and technology companies and published a book, China’s Cancer Solution, about the healing power of reishi mushrooms. Her most notable book is The Llamas of ShangriLlama. Sharon steps out into the backyard of her Plano-​area home and heads toward the barn, which is about to be equipped with a heating and air conditioning system. Behind the barn sits a new red trailer used to transport the llamas to school events, to the park for walks, or to the veterinarian. There aren’t any other llama ranchers nearby to talk to about animal husbandry, so Sharon spends considerable time each day browsing the internet and Facebook for fellow llama breeders and ranchers to gather tips on raising, feeding, and caring for them. The Brucatos have learned that llamas must have specific diets and can get sick easily on more than 125 common plants. A relatively young and healthy male llama (many live into their late teens) commands an average of $1,500 to $2,500 when purchased through a breeder (females usually cost $3,000 to $5,000). All six of the Brucatos’ llamas are purebred and qualified to compete in llama shows held at county fairs and other special events. But the Brucatos don’t allow their llamas to compete on the show circuit. Shangri­Llama makes its money offering the public what it calls Llama Llessons, as well as the opportunity to walk the Brucatos’ llamas through a nearby park, tethered to a leash, for $50 a person. ShangriLlama also sells llama books and llama pajamas (which are especially popular in Australia, according to Sharon)—made by the Brucatos and sold at the ranch and online. The Brucatos teamed up with an Incan tribe in Peru to make llama dolls that look like the pack at the ranch, which are available for sale with the professionally illustrated The Llamas of ShangriLlama children’s book that teaches 30 facts about llamas. Jessica Chen The llamas of ShangriLlama. A new GameStop commercial features Dalai Llama with the help of voice actor Patrick Warburton, best known for his role as Puddy on Seinfeld. And Bahama Llama, a former three-time grand national champion, visits The Statler Hotel in Dallas for fancy events, using the elevator to reach the second-floor ballroom. Llamas can kick, but they only kick predators. They can run as fast or faster than a horse, at up to 35 miles per hour. But the llamas seem oblivious to their celebrity as Sharon steps into the barn. Dalai Llama has his own stall since he is the “king of the llamas.” His eyes are a silvery blue, a rare trait, his coat a bright white. In the other stall, Bahama Llama, Barack O’Llama, Drama Llama, Pajama Llama, and Como T. Llama munch on hay scattered across the floor. When the barn is packed full of visitors, Sharon hooks up to a microphone and greets everyone. She gets into myths first. “How many people have heard that llamas spit?” she asks the crowd. A mass of hands shoots up in the crowd of about 20 people. Sharon explains that llamas spit at each other in their challenges for rank in the pack and to show dominance, but that llamas who are raised right and aren’t abused don’t spit at people. “Well, that’s a relief,” a woman replies. Sharon dispels other common myths. Llamas can kick, but they only kick predators. They can’t bite because, like cows, they have no upper front teeth. They can run as fast or faster than a horse, at up to 35 miles per hour. They don’t produce enough wool to be profitable. She picks up a plastic banana and holds it up to her head, explaining how llamas use their banana-shaped ears to communicate, wiggling them back and forth. The yellow fruit catches Pajama’s attention. As a recent arrival, he hasn’t gotten completely used to this part of the lesson. He still thinks the banana is a treat for him, and he stretches out his neck. Sharon tries to pull the banana away, but when Pajama Llama doesn’t stop, she lets out a heavy sigh and holds out the plastic fruit for him to inspect. He opens his mouth and closes it over the banana. Since he doesn’t have any upper front teeth, the prop slips out of his mouth. He sniffs at it, then heads off to eat more hay. 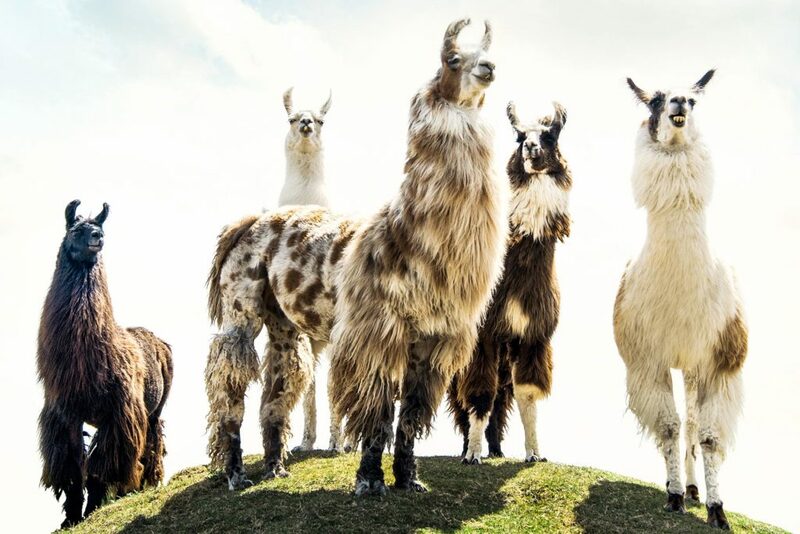 Como T. Llama (center) has his own IMDB page. He starred as Detective Buddy Callahan on the Starz Digital series Llama Cop. As Sharon closes out the Llama Llesson, the first of the walkers shows up. All of the llamas except Drama Llama, who has arthritis in his right foot, will be going out. It’s a short ride to the park in the trailer. When the llamas arrive, parkgoers stop whatever they’re doing and move closer to the trailer to watch them unload. Live-action role-players, dressed as knights and wizards, drop their foam swords. A local church group stops its game of capture the flag. Llama walkers scurry over to the trailer to try to improve their chances of getting to walk their favorite llama. The address for ShangriLlama is kept secret until a visit is booked, for the safety of the llamas and privacy of the family. For information or to schedule a trip, go to shangrillama.com. Llama Llessons are $20 a person, and llama walks are $50 a ticket. Write to [email protected].